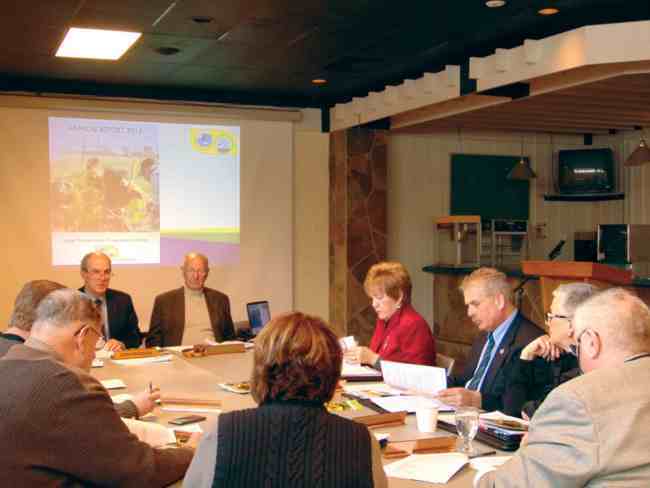 Conservation Authority Budget Approved for 2015. The Lower Thames Valley Conservation Authority (LTVCA) held its Annual General Meeting on February 19 at the University of Guelph Ridgetown Campus in the Municipality of Chatham-Kent. John Kavelaars was elected as Chair and Linda McKinlay Vice-chair. Mr. Kavelaars is a Municipal Councillor for Southwest Middlesex and Mrs. McKinlay is a Municipal Councillor for the Town of Lakeshore. The 2015 budget of $2,784,687 received approval at the meeting. Funding sources include 18.48% grants; 6.03% matching general levy; 17.88% direct special benefit levy, 23.65% non-matching general levy, 25.3% general revenues; 2.01% grants and revenues from the Lower Thames Valley Conservation Foundation; and 6.64% reserves. The 10 member municipalities of the Lower Thames Valley Conservation Authority include Chatham-Kent, Dutton/Dunwich, Lakeshore, Leamington, London, Middlesex Centre, Southwest Middlesex, Southwold, Strathroy-Caradoc and West Elgin. Each municipality appoints a Director as their representative to the LTVCA Board for up to a three year term. The LTVCA staff made presentations and reports at the meeting including the 2014 Annual Report, and a water management report on the state of the watershed. Highlights of the year included the recognition of the contributions made by over 900 volunteers who gave over 2,600 hours of their time and the $850,000 of support given by private, corporate and government grants and donations to conservation works. Emphasized were the benefits of the investment in the flood control structures of the lower Thames watershed and the monitoring of watershed conditions during a potentially high flood prone year. Over 70,000 trees were planted, with 35 hectares reforested, 18 hectares of prairie planted and 84 hectares of wetlands constructed in Chatham-Kent. Local stewardship initiatives were highlighted, along with the various education and outreach programs offered by the Conservation Authority. Objectives of the Conservation Authority include protecting life and property, protecting and restoring habitat, research and monitoring, providing opportunities to enjoy, learn and respect through strong partnerships with the local community. These are accomplished through programs including water management, municipal plan review, tree planting, land stewardship, preservation of conservation lands, education and outreach, and community relations. Most programs of the Conservation Authority showed an increase in activity last year. Reports were all well received by the Directors who provided constructive comments on behalf of their respective municipalities. The LTVCA is a watershed-based partner, working with the local community, providing services and information to efficiently protect and enhance the environment for present and future generations.